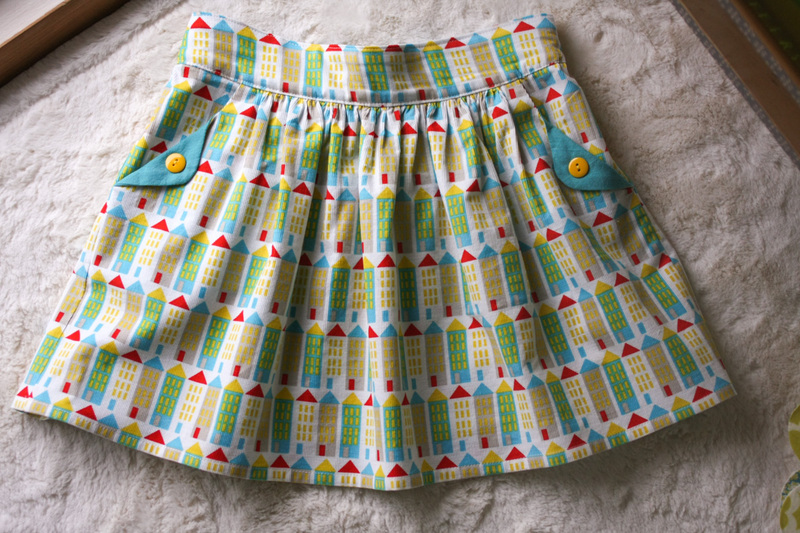 Q: What do you get when you cross Alison Glass’ Handcrafted fabric with the Oliver + S Hopscotch skirt pattern? A: The only article of clothing I’ve sewn in a month! Okay, there’s my icebreaker. Now we can get to the skirt. This yard of the Plus print in Strawberry had been burning a hole on my shelf for some time, I just couldn’t decide how to put it to use. I hope I did it justice. The whole Handcrafted collection is stunning, the colors really glow. It’s hard to capture, but I think these photos are the best representation. 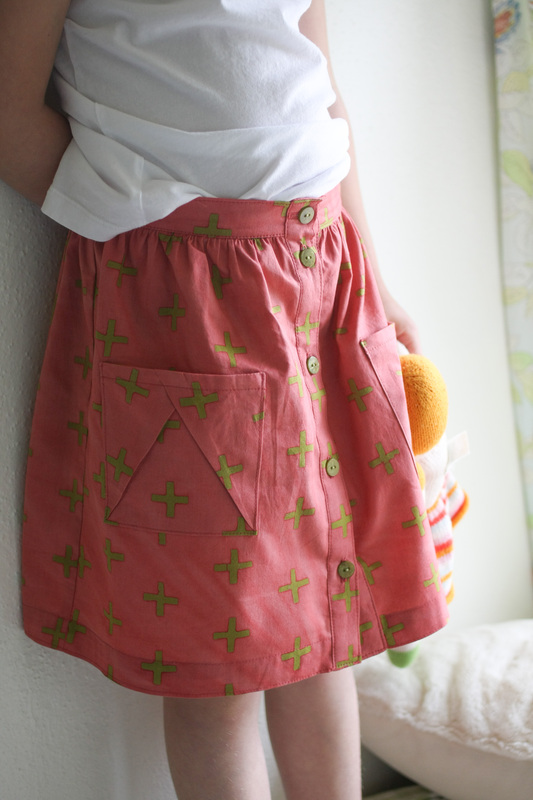 I’ve made the Hopscotch skirt several times, so there isn’t much I can say about this pattern that hasn’t been said. I love the style, though – simple but sophisticated, and the elastic back waistband makes it practical to wear. 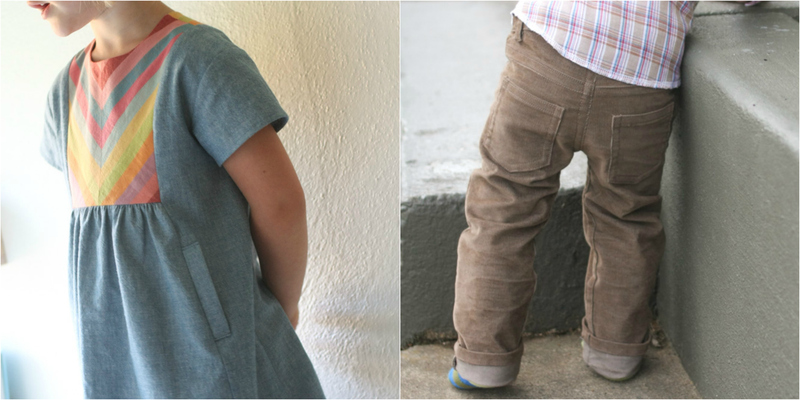 And of course, the pockets are genius. 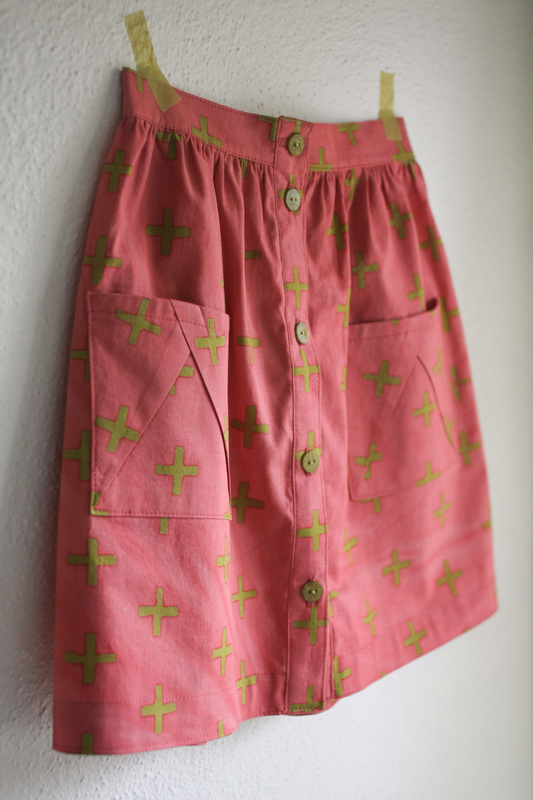 I’m feeling inspired to sew some summer things for Lila, more skirts for sure. And last week I bought this pattern to sew for myself. There’s an 83% chance I’ll chicken out on that one, though. We’ll see. Today I’m joining the It’s a Small World (blog tour) After All to show you a little bit of Rae‘s new fabric line for Cloud 9, Small World. It’s here, it’s great, and it’s corduroy! 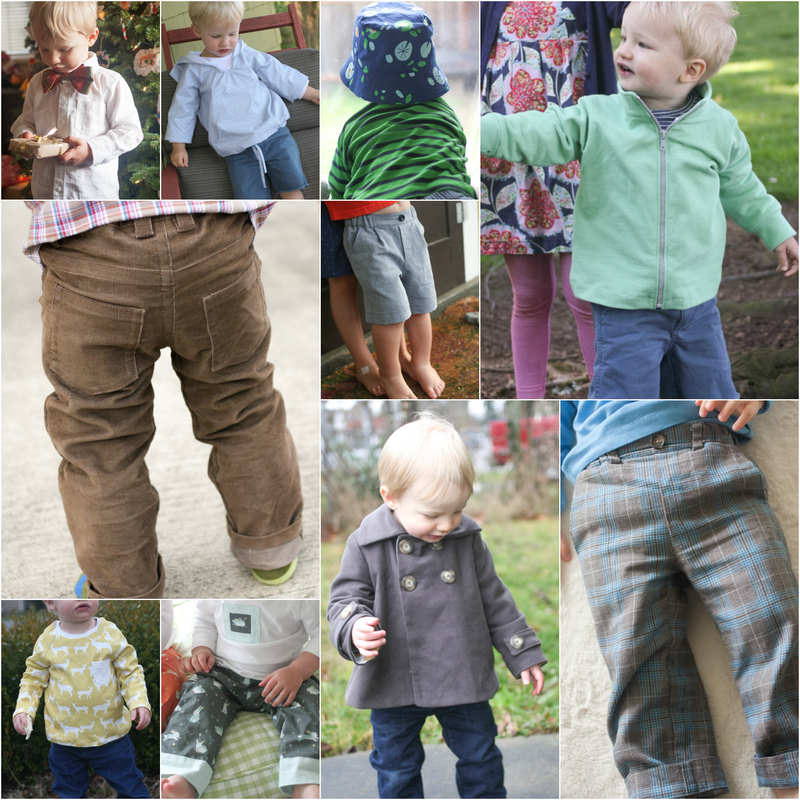 Corduroy makes such a wonderful garment fabric, but the selection of prints has always been pretty dismal. Until now! It’s so exciting to see these bold, bright, Boden-esque prints on super soft, baby wale, organic corduroy. Rae did a beautiful job with these, and I really hope this substrate starts popping up more often. 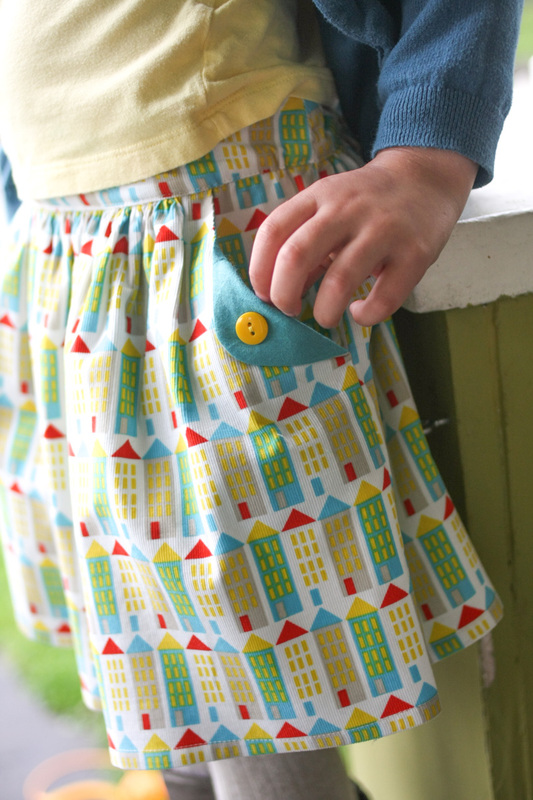 I think skirts are a great place to use a bold print (this one is City Streets), and I knew right away it had to be the Compagnie M Lotta skirt, which I’ve wanted to try for the longest time. Marte of Compagnie M designs some really cool and unique patterns, and they always seem to catch my eye. 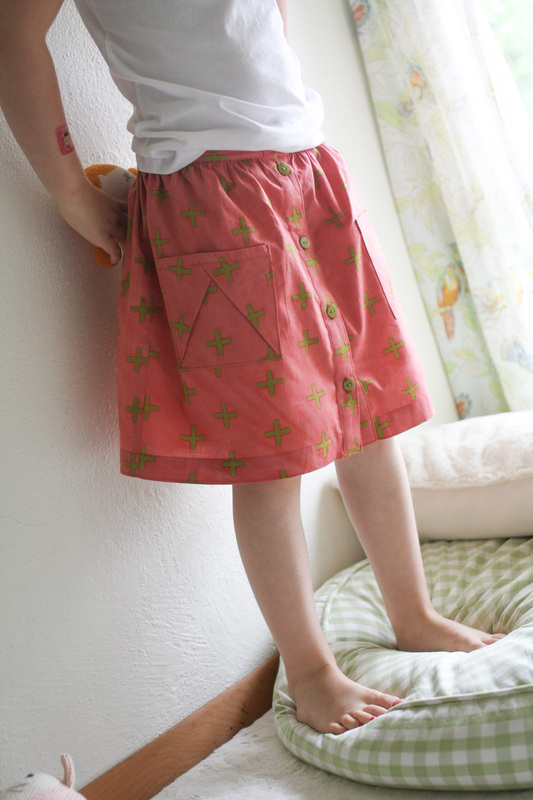 The Lotta is a simple gathered skirt with a flat front waistband and invisible zipper back closure, and the cutest little fold-over pockets you ever did see. 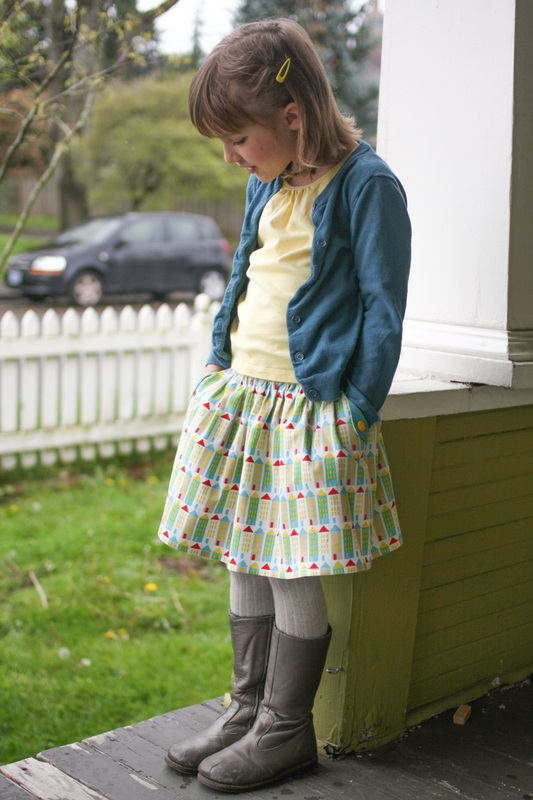 The Lotta skirt comes in women’s sizes, too, and there’s also a Lotta dress for girls. 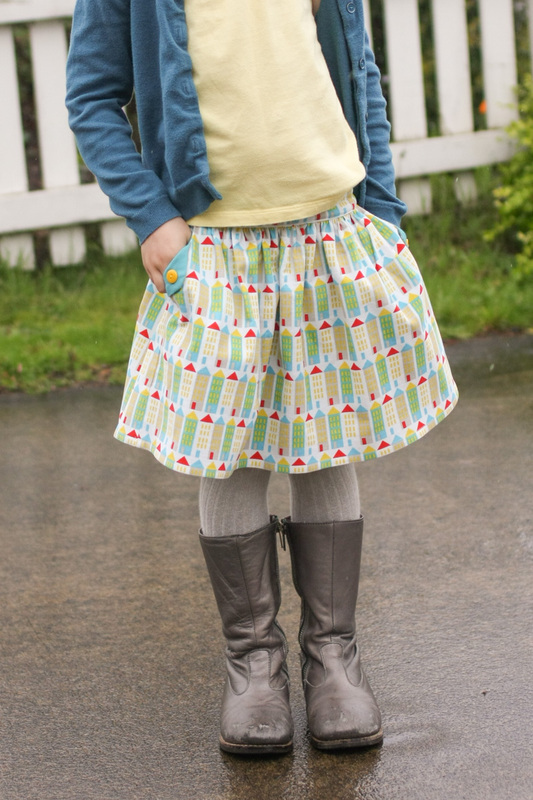 I made the skirt in a size 5 (lengthened to 6) and added the optional adjustable waistband in the back. I ended up having to cinch it up quite a bit, so the waistband ended up a little bunchy – I think that’s just what happens when you put .75 inch elastic in a 1.75 inch waistband. It’s not a huge deal since her shirt covers it up, but next time I might just size down in the waist so that it fits correctly without any adjustment, or else scrap the zipper entirely and just elasticize the whole back waistband (like the Hopscotch Skirt, for example). The corduroy worked really nicely for the skirt, though – it’s a perfect weight for apparel and is light enough to gather beautifully. For more inspiration, check out Kristin and Tara and Rae‘s delightful Small World creations, and there’s more to come in the tour as the week goes on! Small World is available around town and online, and Jones & Vandermeer has the whole collection in stock if you’re looking. Speaking of which, thanks for all who entered last week’s giveaway! 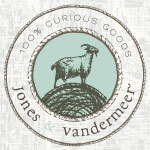 The winner of the Jones & Vandermeer gift certificate is commenter #20, Sarah M. Congrats!! Lila will be six years old tomorrow. 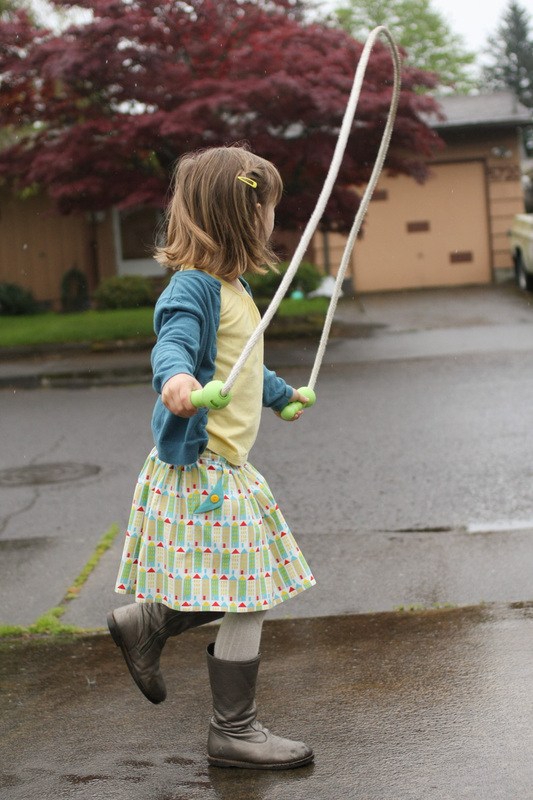 She has turned into such a kid this past year – jumping rope, rollerskating, writing stories, sounding out words and spelling them in that totally wrong but adorable way that kids this age do. The stuff of kindergarten. I love witnessing her attempts to master each new skill. It doesn’t all come naturally to her, but she’s got major sticktoitiveness, this girl. Such focus and determination, and such pride in each small victory. 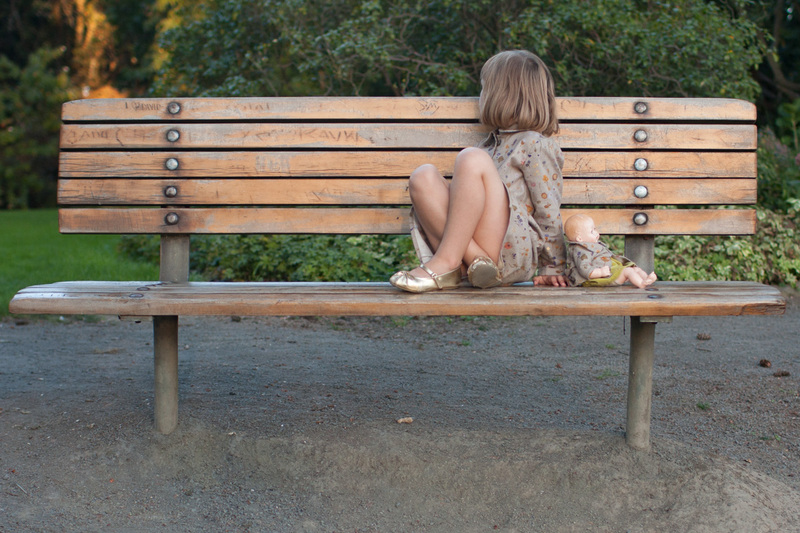 Her palms are raw with callouses and blisters from the monkey bars. Her handwriting is already better than her dad’s. And just like every new age, I can’t wait to see what six brings. I haven’t been sewing much lately, but I’m always up for a birthday dress. This year I chose the Caroline Party Dress by Mouse House Creations. 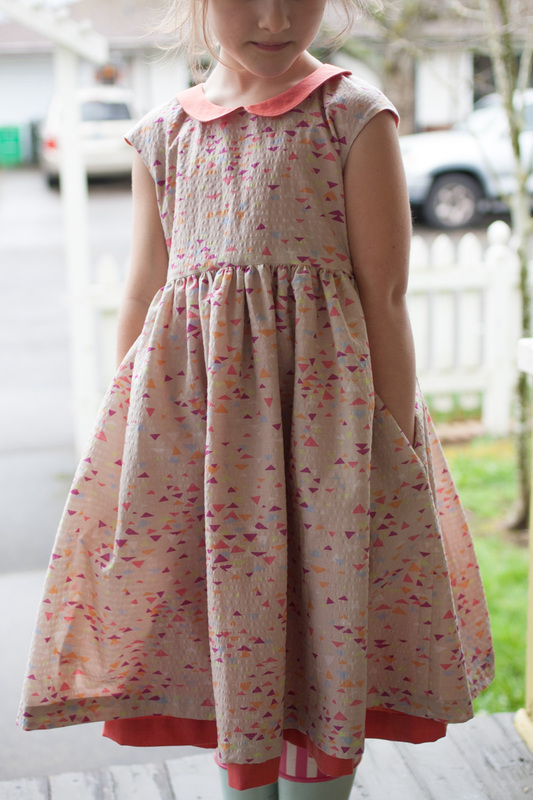 My use of this pattern was 100% inspired by Tara’s recent birthday dress for her newly six year old. Tara’s was the perfect combination of fancy and simple and delicate and beautiful, and I decided that six was the year the birthday dress should close with an invisible zipper. 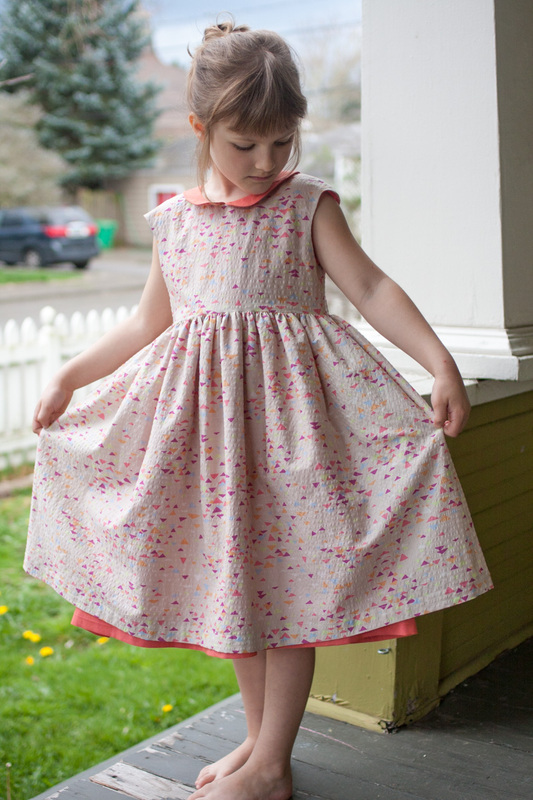 The shape and construction of this dress are very similar to Rae’s Geranium dress, – gathered empire waist, faux cap sleeves, side seam pockets, lined bodice. The major differences are the invisible zipper (which somehow equals fancier to me), and a few other options, such as a collar, a full lining, and a tulle underskirt. I skipped the tulle but did a full lining, which adds some nice volume to the skirt. 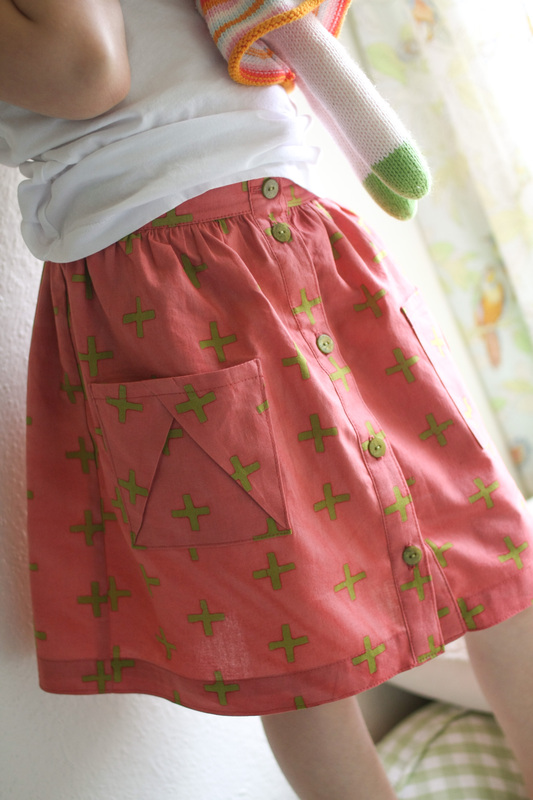 It also helps that I accidentally cut my skirt pieces to a size 7 width – that’s what happens (to me anyway) when you have to make your own rectangular pattern pieces and you’re trying to do the math on combining two sizes – all the measurements kept running together. But it just meant some extra gathers, which isn’t the worst thing when you’re making a party dress. I ended up with a size 5 bodice and a skirt somewhere between a 6 and a 7 – it’s long, but I like the fit. The main fabric is a Japanese seersucker lawn, bought last May from Miss Matatabi. I’ve lusted after so many things from her shop, but this has been my only purchase so far. I fell in love with this one immediately – the colors, the crinkly texture, the triangles. It’s no longer available, but the shop is full of the most amazing Japanese fabrics and is worth checking out if haven’t already. 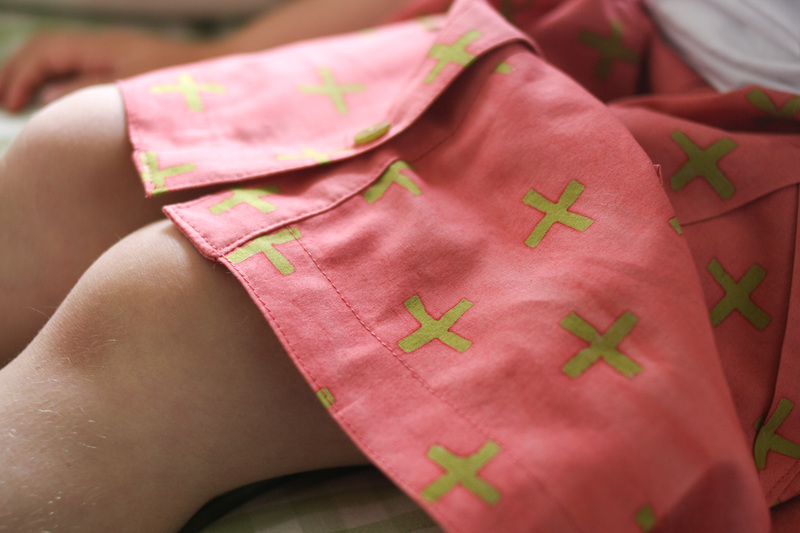 The lining fabric is Watermelon shot cotton, which I also used for the collar. Based on Rachel’s lovely version, I cut the skirt lining a little longer than the outer skirt so it would peek out at the bottom. 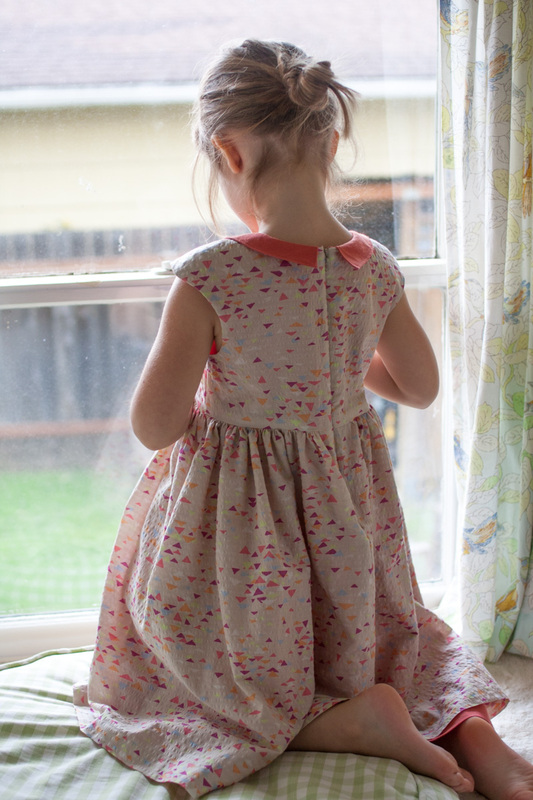 This dress feels wonderful – both fabrics are very soft and light, but it’s a lot of yardage (three in total) – so it’s weighty, but light and flowy at the same time. It’s a little bit dressier than what I usually make, but hey, turning six is a little bit special. 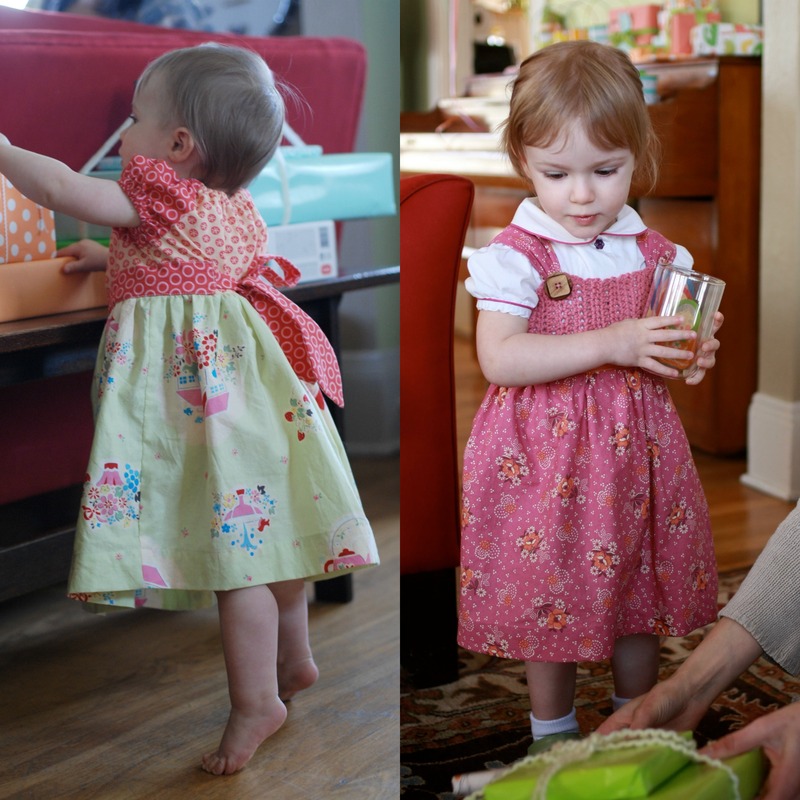 I went back to look at each of Lila’s handmade birthday dresses. We’re six for six. 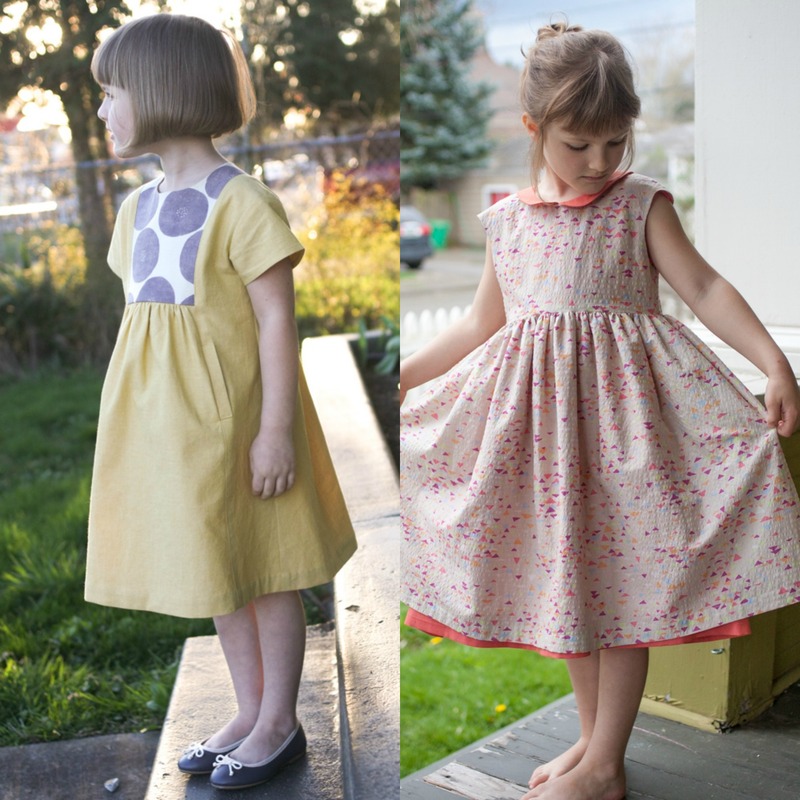 My mom made the first two (back when sewing a dress seemed way out of my league), and I took over from there. I hope there are plenty more to come. As I was going through my photos from the year, I realized I made not ONE SINGLE THING for myself in 2014. Terrible, I know. 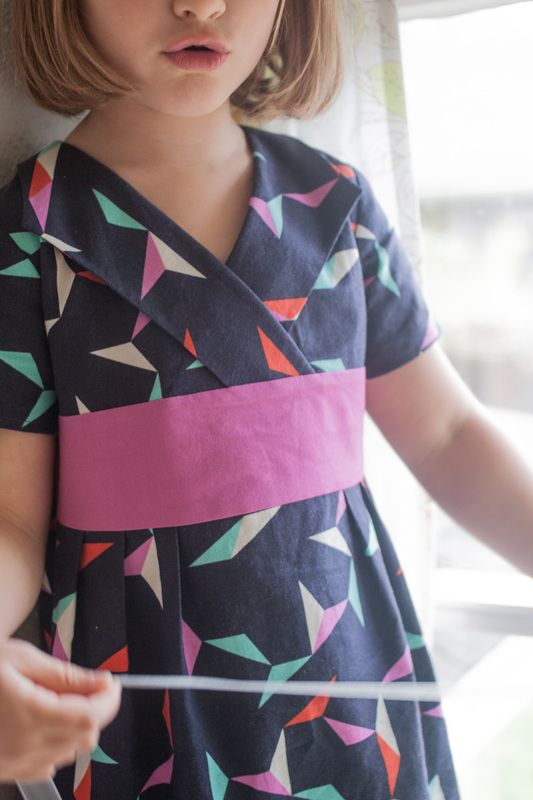 The truth is, I did sew a few things, just nothing worthy of sharing – I made a Wiksten Tank and the Liesl & Co Bistro Dress, and while they were both great patterns, neither was especially flattering on me. I’m still trying to figure out sewing my own clothing, and clearly it isn’t going all that well. Maybe 2015 will be my breakthrough year. So what did I sew? Well, Lila scored a few new dresses. Fifteen to be exact. 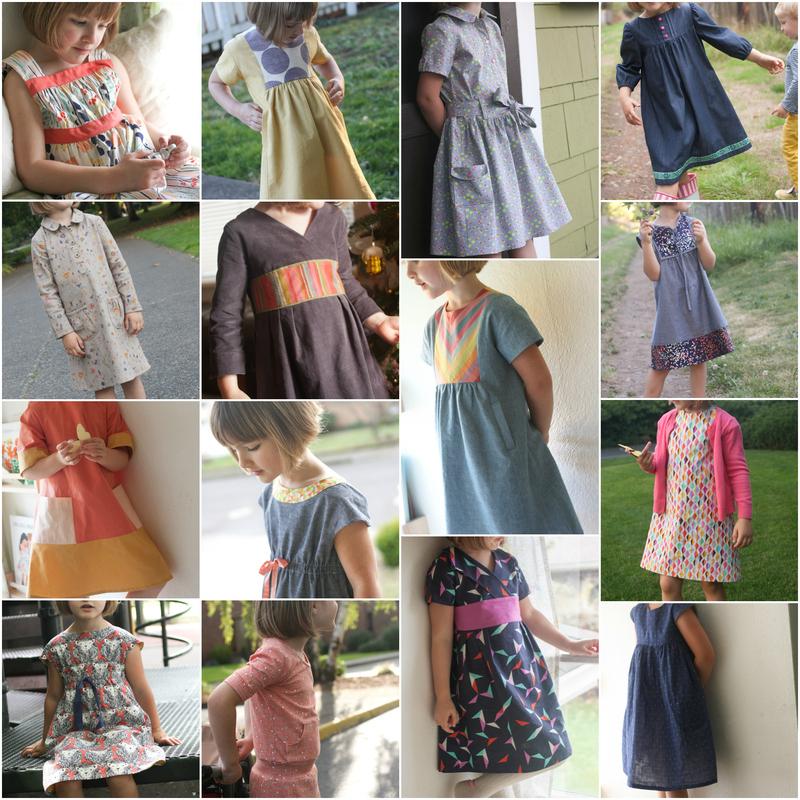 I learned to use and love my serger this year (it only sat in the box until April – not half bad, right? 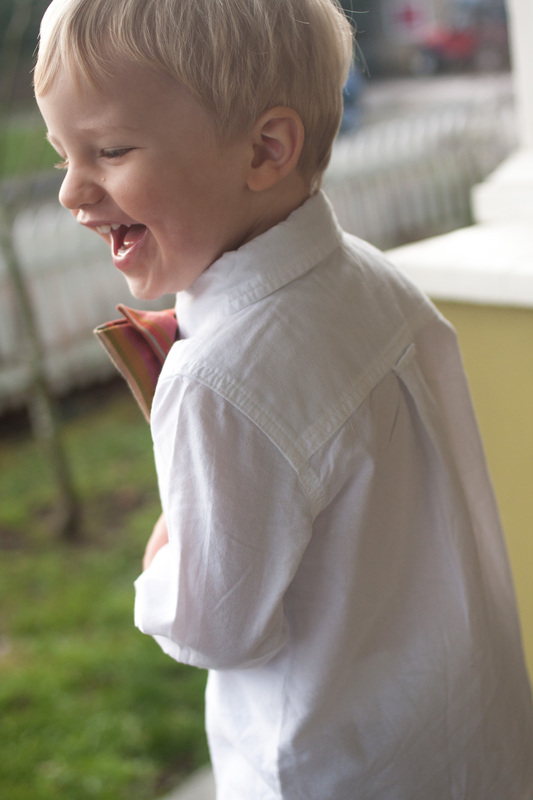 ), and I learned to love boy sewing just a little bit more. And what I already knew was reinforced: making dresses sure is fun. The truth is, I don’t have any huge goals for the new year. 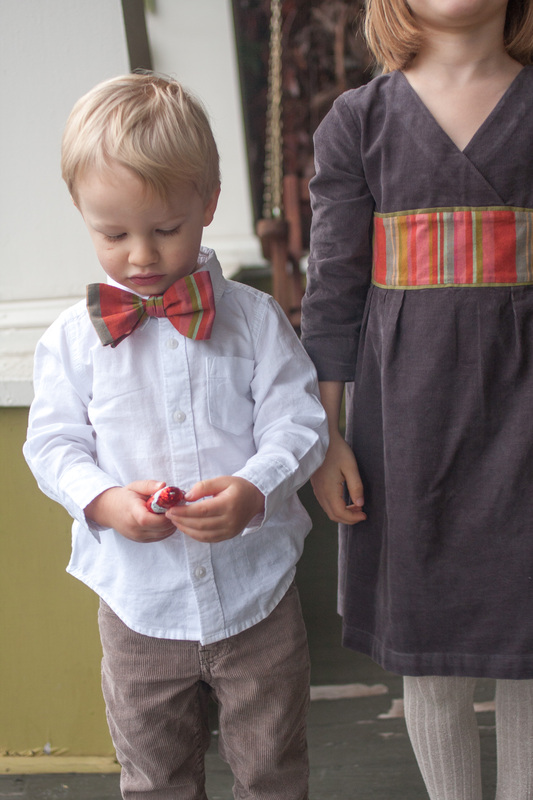 I just want to make pretty things and then marvel at my kids as they wear them. I know it isn’t much, but that’s what makes me happy. 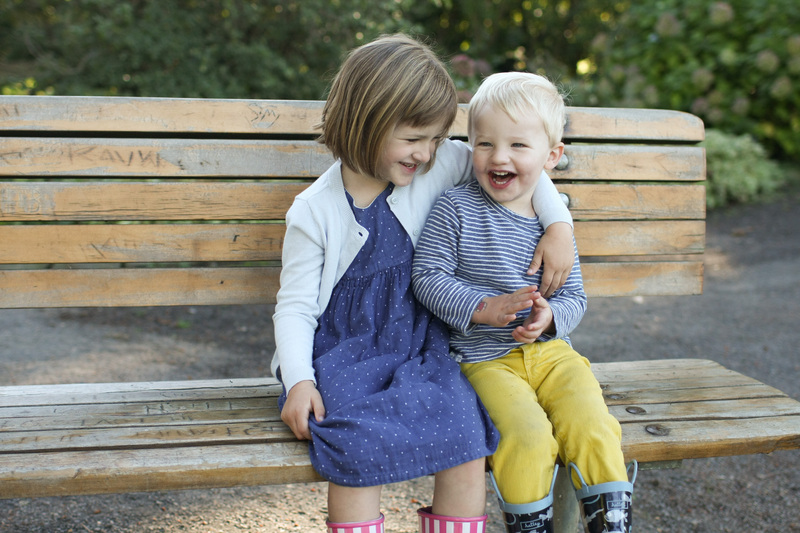 So anyway, Happy 2015 from these two, my reasons for sewing. 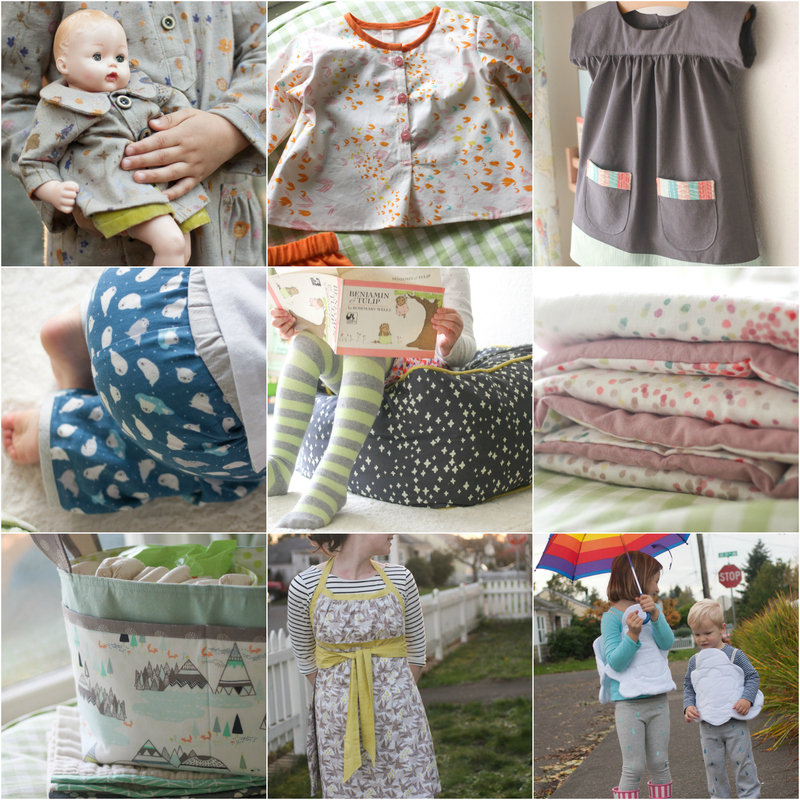 I tried to keep my December sewing to a minimum this year, which was really very nice. 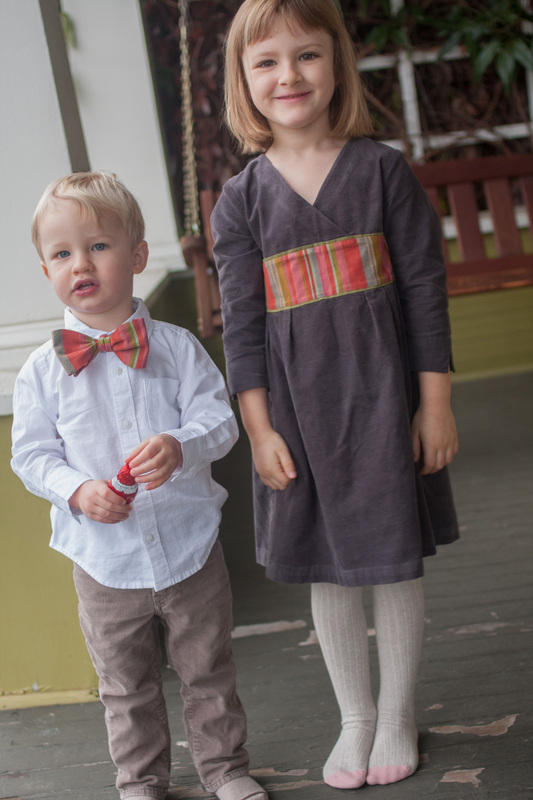 Christmas clothes weren’t originally on my list, but then I saw the adorable plaid Art Museum vest Elizabeth (of the lovely blog Lizzieville) made for her little boy. She mentioned in the post that her daughter asked for a dress to match, and suddenly my kids needed matching Christmas outfits, too. And so, I sewed. 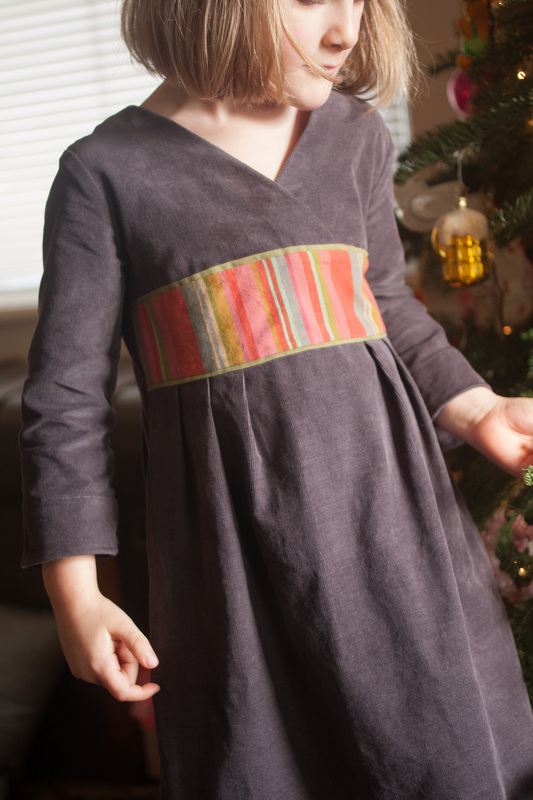 Elizabeth was actually the inspiration for the dress, too – I really loved her Library Christmas dress from last year, and I also came across this beautiful corduroy/Liberty version via my Oliver + S Flickr group search. So, despite having just made a Library dress (and swearing off this view), I decided on View B in baby cord with a floral band…but then I never found a good floral. I almost scrapped the whole thing, but at the last minute I looked through the piles of fabric already on my shelf and found this striped shot cotton. I can’t recall why I bought this fabric in the first place, but I’m pretty sure it ended up lost in the stacks because the colors reminded me too much of Christmas. So anyway, long story short, I ended up with dark gray Kaufman cord, some forgotten striped shot cotton, and flat piping in a green Modern Solid. I sewed a size 5 lengthened to a 6, and also lengthened the sleeves by an inch. Lila isn’t a big fan of 3/4 sleeves so I wanted to pass them off as long sleeves. She won’t wear them rolled up, but I do love the notched cuffs. 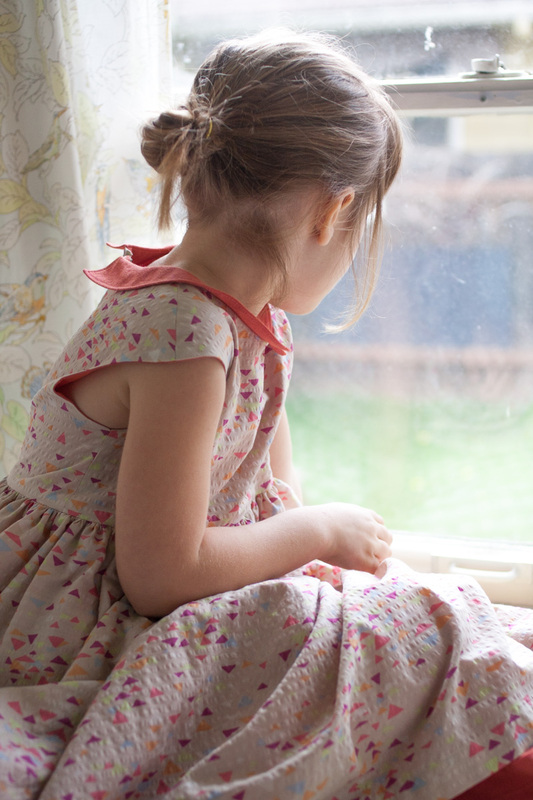 There wasn’t enough corduroy for the facings (I squeezed the whole dress into a wide yard of fabric with some very careful planning), so those are cut from the shot cotton. 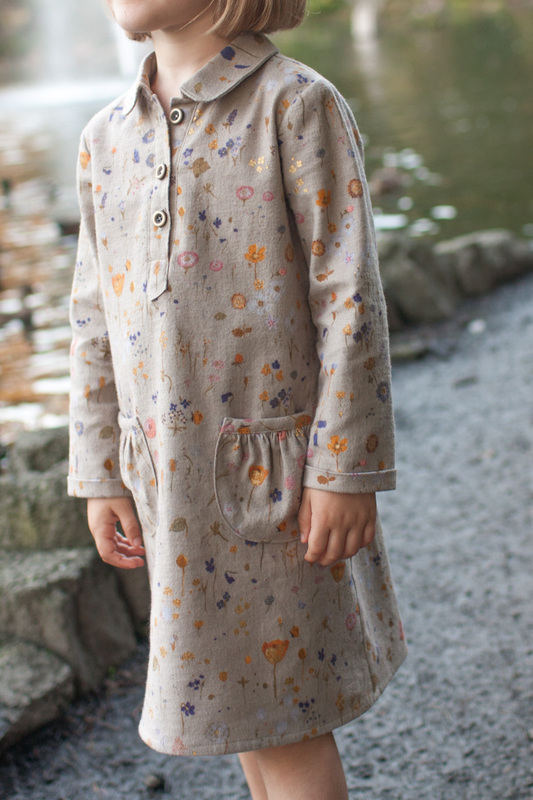 Luckily Liesl has you understitch all the facing seams, so there’s no chance they’ll be peeking out when they shouldn’t. But they do make for a nice surprise inside. Having made both views, I think the collar must give the neckline a little more structure and hold it in place, because the neckline on this dress gapes a little more than the collared version. Nothing too serious, but I did notice a difference. And again with all those buttons down the back. But I was happy to find these little black and green ones. Now, on to that bow tie. 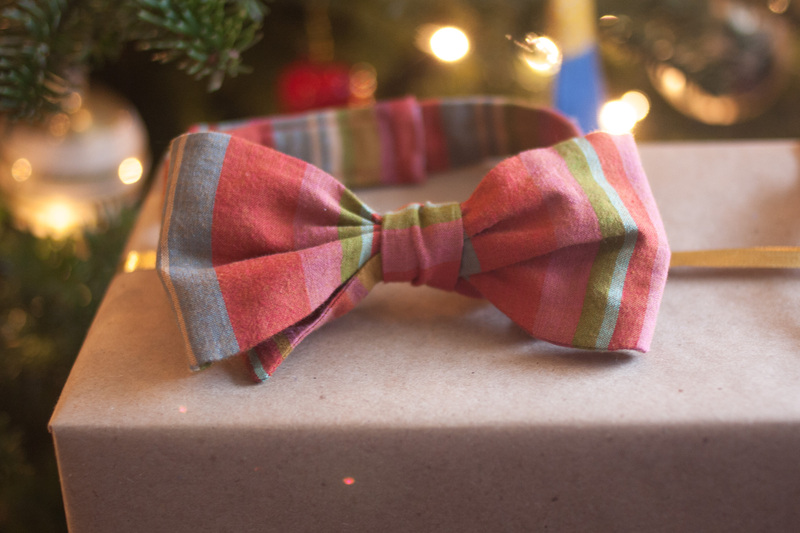 I read through just about everything the internet had to offer on the topic of making your own bow tie, but in the end I used Delia‘s free Mix and Match Bow Tie pattern and tutorial. I knew I could trust Delia. 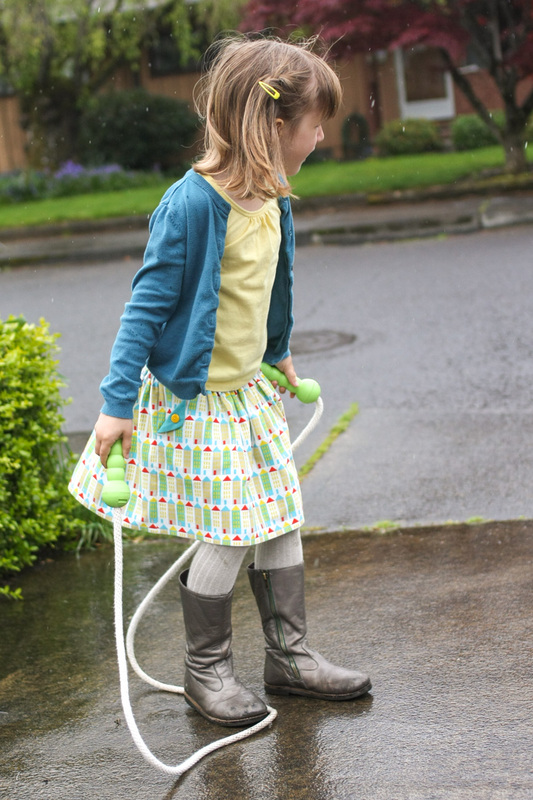 It was super simple and quick to sew – in fact, I bet I spent more time learning how to tie it than actually sewing it. 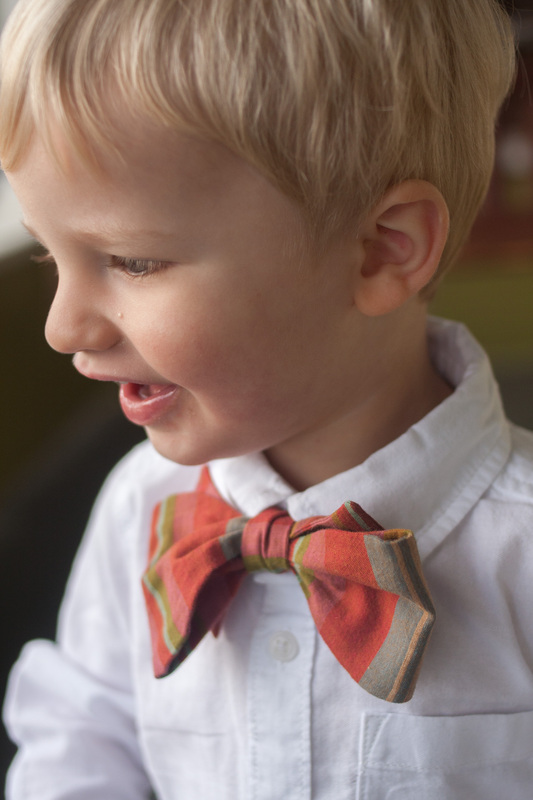 But thanks to YouTube and Jesse Tyler Ferguson (Lila and I must have watched this video twenty times, she thought it was hilarious), tying a bow tie is now on my list of life accomplishments. Apparently bow ties are usually cut on the bias, but since shot cotton already has some stretch, I cut it on the grain. And I used velcro as my back closure method rather than swim suit hooks, just to make sure it was good and adjustable. It’s a little droopy (interfacing could have solved that) but I love it just the same. 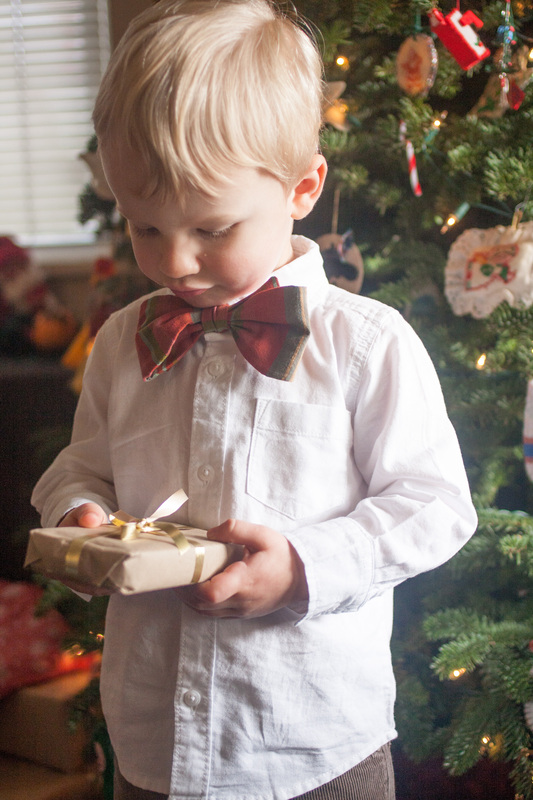 Who knew I’d ever get so excited about a bow tie? 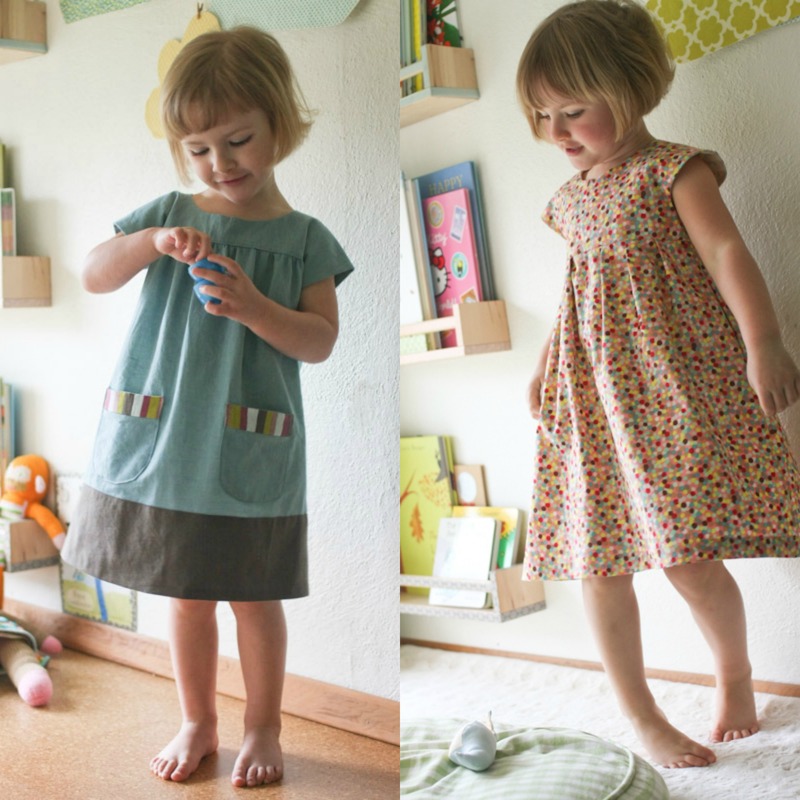 And to think, I was so broken up about not having two girls to sew for…this is totally just as great. Maybe even better. Maybe. Sort of. Whatever, it’s great. They were pretty cute together. I’m officially a fan of coordinated holiday attire. There were also some eleventh hour semi-coordiated Christmas pajamas that I’ll share just as soon as I can get my children to cooperate for photos. 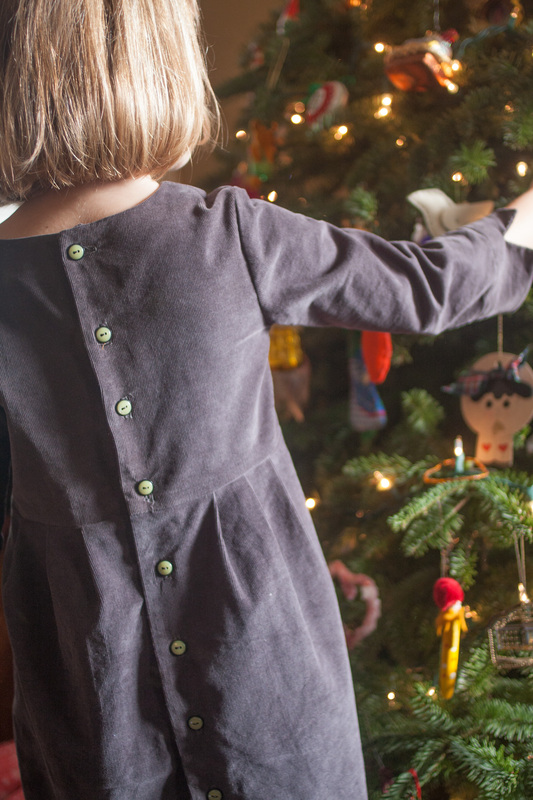 Hope everyone’s holidays were happy – enjoy these last few days of the year! Oh hi, I’m back from my month-long vacation on the couch. Pretty sure I watched more TV in the past 30 days than in the last four years combined. 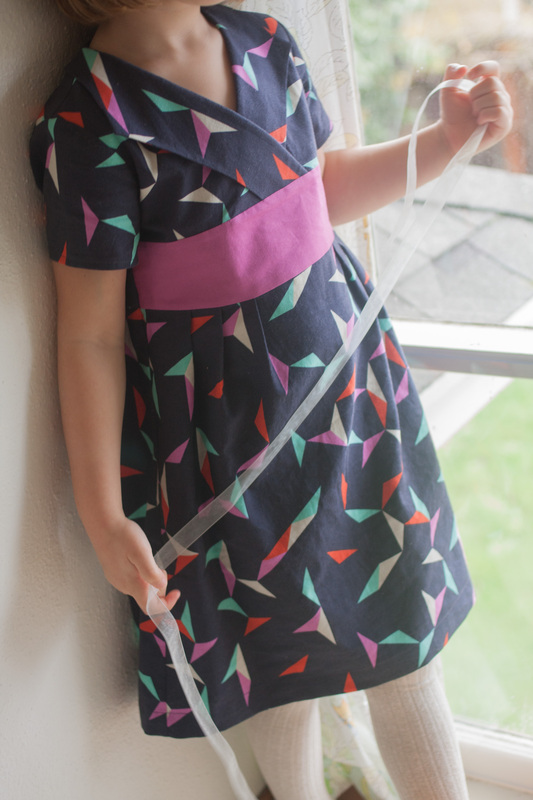 But anyway, here’s what I have to show for myself – an Oliver + S Library Dress. 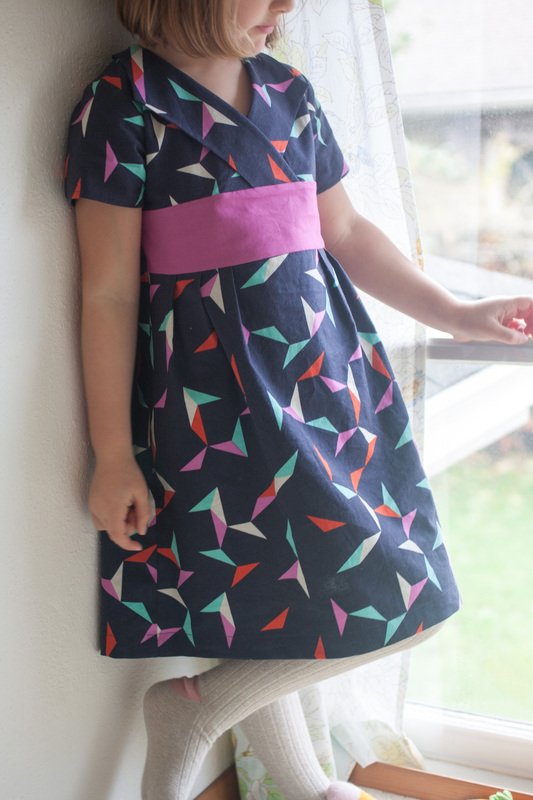 I made one from Rashida Coleman-Hale’s 1000 Cranes fabric last fall, and I’m not sure if it was the fabric or the pattern or the combination of the two, but that dress was one of my very favorites. 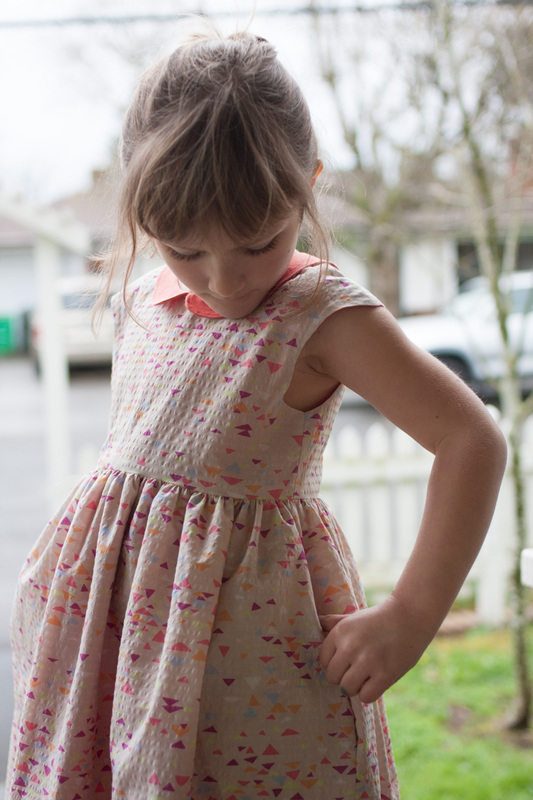 Lila liked it, too – she wore it long after the length became indecent (which happened pretty quickly – this dress runs shorter than other Oliver + S patterns, be warned), and I was so sad to retire it. So here’s version 2.0 – more Rashida Coleman-Hale, this time in Tangrams from her Cotton + Steel Moonlit collection. I love the colors in this print, and I picked a coordinating Cotton Couture solid for the band (Peony, I think). 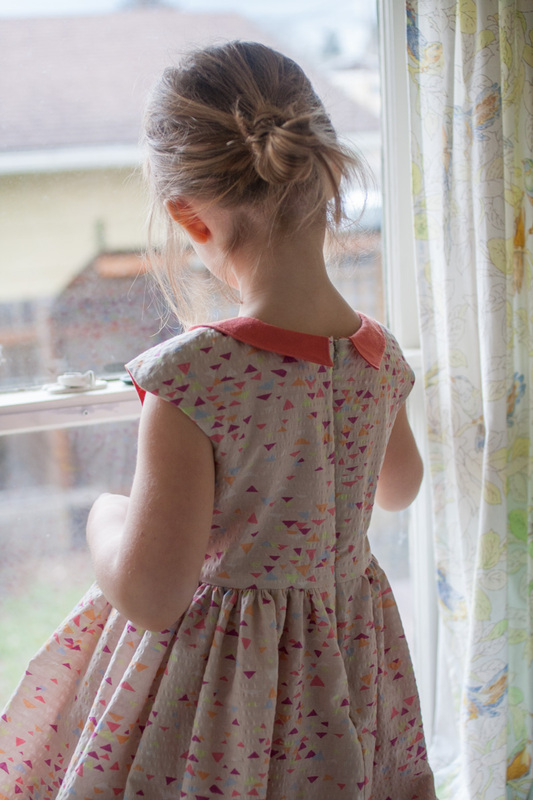 I went with View A again (short sleeves and collar) – I always feel like I should try the other options when I make a pattern the second time, but then I never do. If it worked out the first time and was well received, I usually just stick with it. The only thing I left out this time was the flat piping – I love how it looks but couldn’t come up with a fabric I wanted to use. And I remember from last time that with the collar and the bodice and the band and the piping, that seam gets really bulky. It was a bit more streamlined this time. This is a size 5 lengthened to a 6, which I think came out about right. 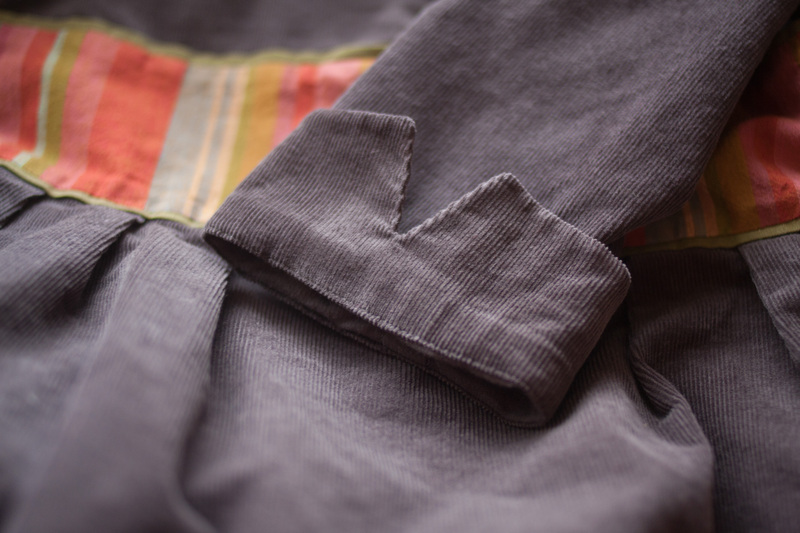 I can’t say that this closure method is my favorite – 9 buttons/buttonholes! But Lila doesn’t seem to mind it, and that V in the front makes it easy to get on and off without unbuttoning more than one or two buttons. 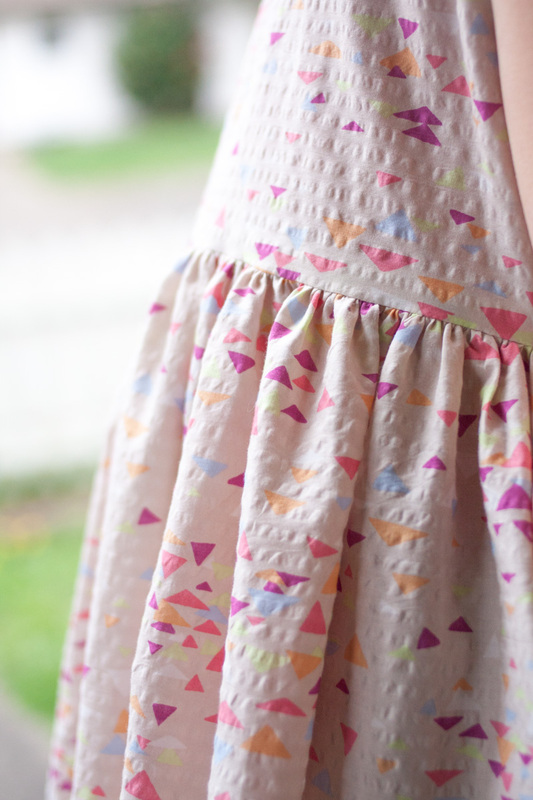 Thanks to LiMa Sews for this beautiful fabric! 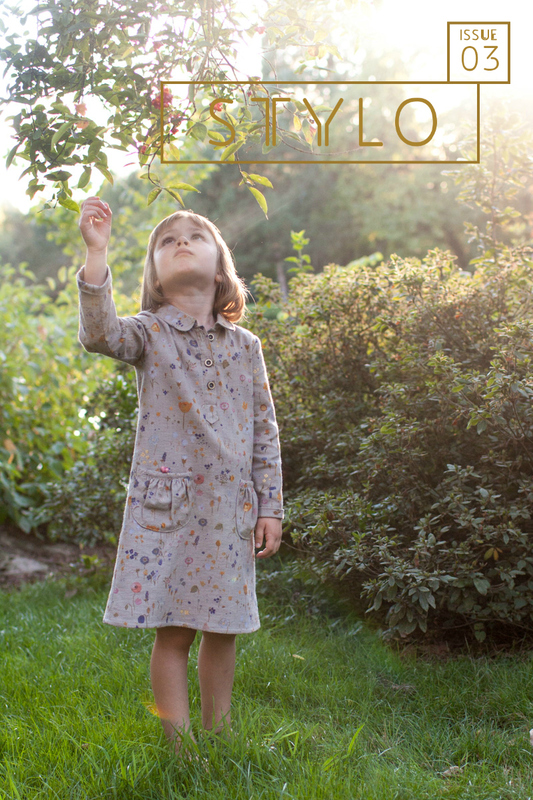 The online magazine STYLO just launched a third issue, and if you love kid fashion and sewing, you’re sure to be inspired by what you find inside – gorgeous images of handmade children’s clothing, artfully compiled by Celina Bailey and Jessica Abbott. 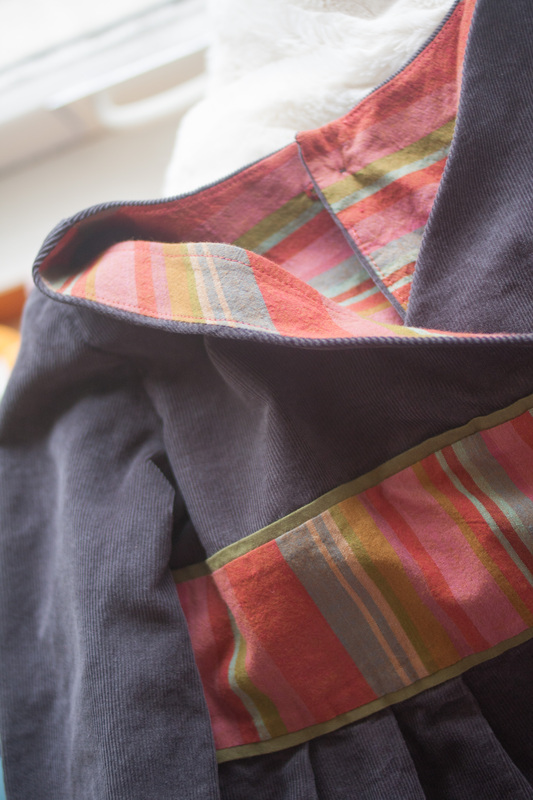 As a contributor to the 1 Fabric/5 Designers spread, I received this beautiful Sen Ritsu brushed cotton from Nani Iro, courtesy of Miss Matatabi. 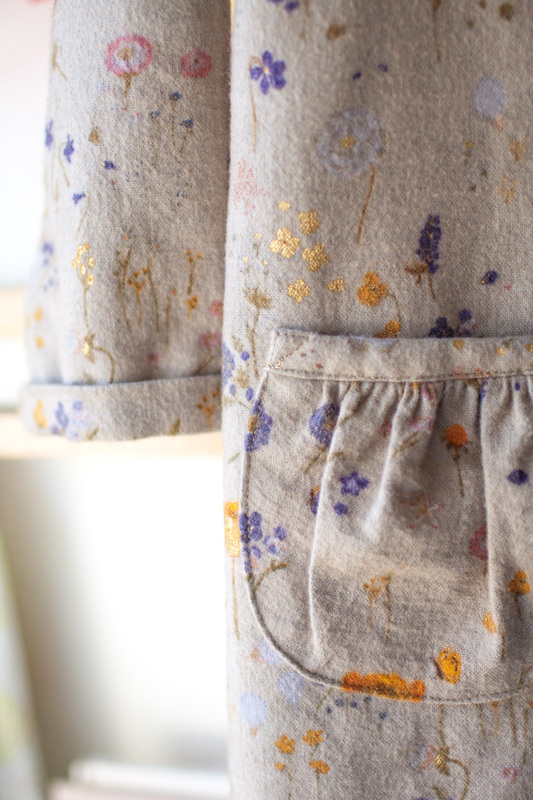 It’s always a treat to sew with Nani Iro, and the brushed cotton is especially luxurious stuff. So what did I choose to make with this lovely fabric? Well, an Oliver + S dress, of course. 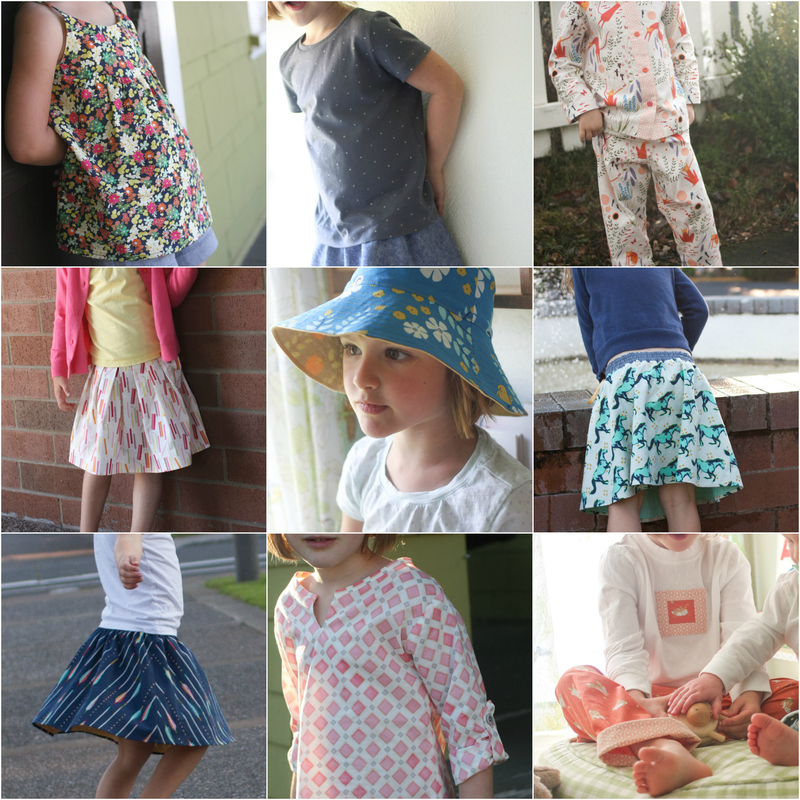 Yes, I’m predictable, and come to think of it, not all that fashion-forward, considering this pattern came out the year Lila was born! The classics are always in fashion though, right? As you might have guessed, it’s the Jump Rope dress, View B. I top stitched everything in gold thread to bring out the metallic accents in the fabric. And our friend Em was kind enough to loan us her fancy gold shoes, too. 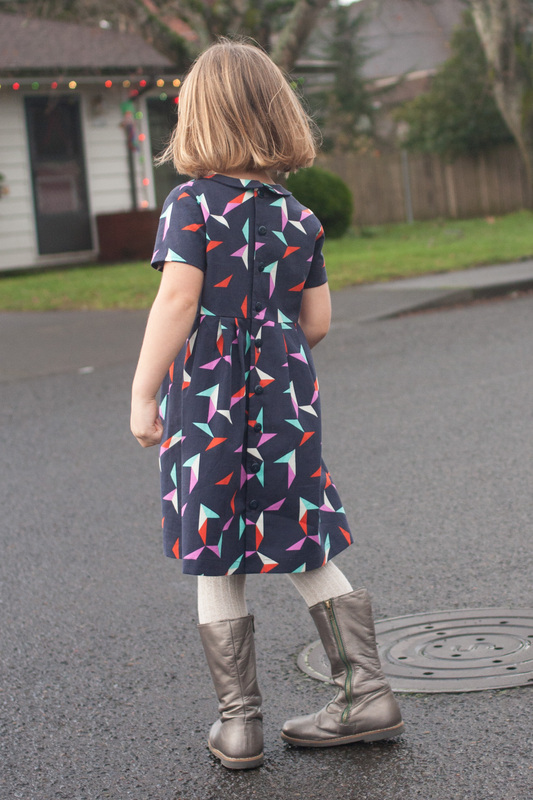 There was leftover fabric, so I sewed Baby Girl a little fall coat, because hey, why not. 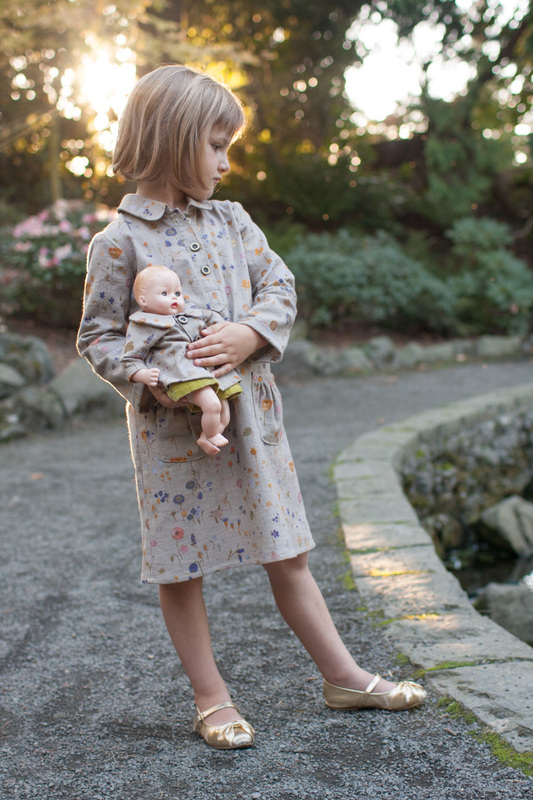 The coat pattern is from McCalls Crafts #5347 (along with most of her dolly wardrobe). Check out all the STYLO 3 golden goodness here! Enter your email address to follow probably actually and receive notifications of new posts by email.